The MCTA was formed as a non-profit, 43 years ago in 1973 at Carlsbad, California. The original members were a small group of retired Marine Tankers. All were senior staff non-commisioned officers. Most of them were survivors of tank combat during WWII, Korea and Vietnam. These men had a desire to stay in touch with former comrades-in-arms, meet new tankers, remain in touch with friends and show support and encouragement to active duty Marine Tankers. The Membership includes warriors who have participated in every battle where Marine tanks were committed in support of a Marine infantry unit. . Below is a list of the most recent joins or upgrades to life membership. If you have any questions or corrections for me- Email me at richhine@comcast.net. 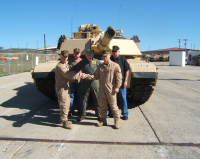 For Related Associations or to Contact Marine Corps Tankers Association Click Here.